How Often Should You Pressure Wash Your Commercial Property? Do you have a commercial property or business building that gets grimy and dirty from the harsh everyday climate? You want to keep your property looking clean and fresh, but does it feel like you no more get commercial power washing completed and it looks grimy again? If so, do not despair! In this short guide, you will be informed on how often you should have pressure washing done on your commercial property in the Columbus, Ohio area. A good time to schedule a commercial power washing would be when the seasons change. This is important to do because leaves and scattered dust can accumulate on the siding of your commercial property. You can also wash off pollen from the spring and summer seasons which is critical for those customers who are allergy sufferers. Giving a good once over after winter is over is also imperative to remove any salt or sand that might have gotten blown up on your siding and walkways from the snow plows in the Columbus area. A commercial property should get a complete professional pressure washing on a regular basis. What constitutes a regular basis? That depends on your corporation. Do they schedule monthly cleanings? Is it in the budget for quarterly washings? Is it set up for twice a year? Once per year? These would all be considered on a regular basis, but it really depends on the firm you work for or own on how often commercial power washing is included in the budget. If you have ever hired a handyman to complete roofing fixes, HVAC repair, painting, cleaning of the gutters, or remodeling after a storm, you know the dirt and debris that a high-powered storm in the Columbus area can bring with it. One good rule of thumb is to perform professional commercial power washing after storms to remove the plant foliage, leaves, dirt, grime, and other debris that has been whipped up onto the commercial building and windows. If your commercial property is in an industrial area or if you perform factory work that gives off a lot of dust or debris, you may need to have pressure washings completed more often than most other commercial properties. In addition, if your business is in the middle of a construction zone, you may also need to perform commercial power washings more often due to the dirt in the air that becomes trapped in your building, siding, and windows. As you can see, there are quite a few reasons as to why you would want to get commercial power washing completed on your business property. Whether due to season changes, storms, or location, pressure washing your business building will keep the commercial property looking reputable and professional. 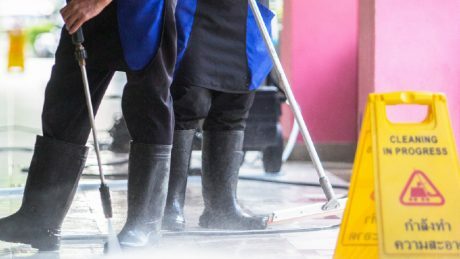 If you follow our advice on how often you should complete power washing on your commercial property, customers will be coming back day after day, which means increased profits for you! It’s finally getting warm again, the snow is gone, and you can finally enjoy the good weather of the months coming ahead, right? Wrong. Well, at least not entirely. Once the low temperatures are gone and you start coming out of your house more often, you will start realizing that cleaning and clearing up outside of your house is the best strategy for you to enjoy this nice weather. Power washing your sidewalks, driveways, and home can make a big difference. The higher the temperatures and the lighter your mood, the more things you will feel like accomplishing. Among those, getting rid of things (hence the raging spring garage sales) and cleaning your home. In all honesty, nobody wants to clean a house, unless it’s theirs. But it’s part of the responsibility of a homeowner: giving maintenance to a house. And Cincinnati power washing doesn’t just benefit you, but everyone on your block. Not only is it important to keep the inside of your house clean, but it’s equally important for the backyard and the front lawn. If your house has a garage on the front, this is the part you will want to pay the most attention to. Stains on your garage floor or on the driveway start making your house look uncared for. Some of the toughest stains to clean are bird droppings or those of your unpleasant neighbor’s dog. Besides, nobody likes unwelcoming smells from unknown sources on the ground. They can start eroding the brick or leaving permanent stains on the concrete. If they’re somewhere on the grass and you can still pick them up (even if they aren’t your dog’s), do it. Bird droppings can also be potentially harmful because of the pathogens and microbes they carry. If a good old hose doesn’t do the trick to areas where it’s still stuck to the ground, try testing power cleaning with a pressure washer. If that doesn’t work either, you might want to look into the equipment that Cincinnati is using. They take sidewalk cleaning to a whole other level because of the number of crows in the area. Now that is what I would call power cleaning. Depending on the weather conditions, it’s recommended to do certain things to keep sidewalks clear and safe for pedestrians. It is the property owner’s responsibility to keep them that way, and not just during the spring. In the wintertime, that means to remove snow and ice to avoid slips and falls. When your garden has been cleaned and mowed, clippings, leaves, and branches from the trees should be removed too. Keeping branches trimmed to keep people from hitting their faces when passing by is also recommended. It’s common to see a lot of people looking down to their cell phones screens while they walk on sidewalks these days. It’s like they’ve got them stuck to their hands. This causes them to stop paying attention to their path, and while we’re not in a situation of the likes of China yet where accidents might happen in the overcrowded street crossings, we might want to start by keeping the way safe for everyone in all kinds of weather.